In this excerpt from his new book Curation Nation, author Steven Rosenbaum examines the origin of one of the first consumer-creator online networks, BlogHer. Early on, back in 2005, three extraordinary women noticed that something was missing from the Internet. They knew that women were blogging, but there wasn’t a central organizing place for them to meet, share ideas, and build a community. The mission of BlogHer was at first community, and as it grew and evolved with the Web, there was an economic mission as well. The world of BlogHer is separated into two areas: BlogHer.com, which anyone can join and participate in; and the BlogHer network, which is a collection of the best women’s blogs and includes an advertising component and revenue share. The network is curated: only sites that meet the published community standards are allowed to join. And that, Stone says, means advertisers know they are appearing only on sites that have signed off the shared standards for credibility and quality. Since the launch of the BlogHer Network in 2006, Stone and her partners have seen exponential growth by all measures: traffic, bloggers, and revenues. BlogHer is now reaching over 20 million unique women each month. The network feeds 25,000 blogs that have been reviewed by editorial team members and has a publishing network with more than 2,500 affiliated bloggers. Is used to abuse, harass, stalk or threaten a person(s). Is libelous, defamatory, knowingly false or misrepresents another person. Infringes upon any copyright, trademark, trade secret or patent of any third party. If you quote or excerpt some-one’s content, it is your responsibility to provide proper attribution to the original author. Contains editorial content that has been commissioned and paid for by a third party, and/or contains paid advertising links and/or spam. Every opinion expressed must be the true opinion of the author. or sponsored posts. BlogHer doesn’t want any blogs with profanity in the title, and the blogs must be written by women. If these standards sound familiar, they should. This is BlogHer curating its network, creating a consistent quality offering for advertisers. Beyond the rules, Stone says BlogHer blogs have one thing in common: passion. 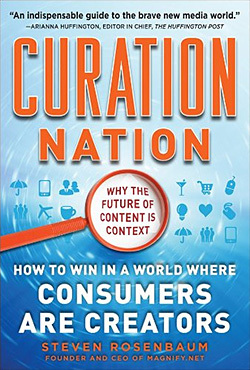 Excerpted from Curation Nation by Steven Rosenbaum, reprinted with permission from McGraw-Hill Professional. Copyright 2011.